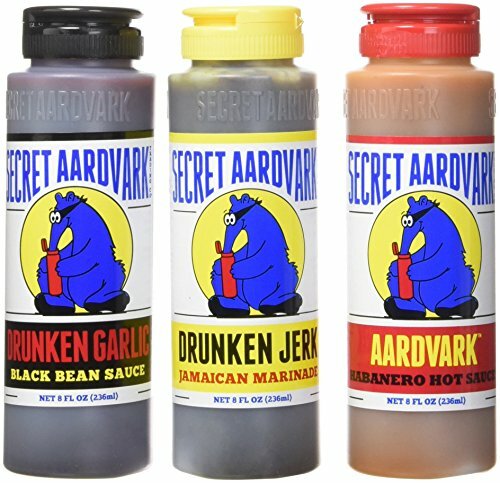 A tasty trio of all 3 Secret Aardvark sauces. Makes a great gift, or an easy way to try our awesome products in one swoop. Secret Aardvark Combo 3-Pack Thank you for using our service International world wide 12-25 Day Guarantee New Package. DRUNKEN GARLIC BLACK BEAN SAUCE - Add some ancient Chinese wisdom, a little American ingenuity, a few shots of southern whiskey and a whole lot more garlic than any well adjusted adult should ever use and here you have it! Use as a marinade, stir fry sauce or with anything you damn well like. USE YOUR IMAGINATION!!! DRUNKEN JERK JAMAICAN MARINADE - A tropical flavor that kicks you in the mouth. Made with habanero chile peppers. This spicy sauce is traditionally used as a marinade for the Jamaican-style BBQ simply known as "JERK." We add a splash of dark rum for a sauce that is as versatile as your imagination & possibly hotter. AARDVARK HABANERO HOT SAUCE - Not your usual hot sauce!!! A unique Caribbean / Tex-Mex hybrid made with flavorful habanero peppers and roasted tomatoes. Great as a sauce, marinade or holistic cure all. "Dump on Everything," the Secret Aardvark compels you!!!!!! If you have any questions about this product by Secret Aardvark, contact us by completing and submitting the form below. If you are looking for a specif part number, please include it with your message.